Beating your opponent to the shot is key, and effective kicking can help. In professional pool, the top 60 to 80 players all shoot as well as the other. The guys who consistently win, however, are the ones who beat their opponent to the shot. That�s a massive element to the game, and it is especially true in 9-ball and 10-ball because once the balls are open, the top players are going to run out. Truthfully, there are plenty of players who shoot better than me, but my safety game gives me a slight advantage in a lot of cases. Winning the safety battles is a huge part of the game, and kicking is a big part of winning those battles. That�s why I spend so much time practicing every aspect of the game, and one of those aspects is kicking. If I�m getting ready for a big tournament, I�ll spend an hour doing nothing but kicking balls. It�s also a great way to get a feel for the table. Like many players, I used systems when I first started playing because I didn�t really know what I was doing. I didn�t have an instinctual feel for how the cue ball would come off the rails. I learned the most about kicking when I was in the Philippines for six months. The Filipino players have always been the best at kicking. They are very intelligent when it comes to pool. Intelligence and creativity are what make players like Efren Reyes and Alex Pagulayan such great kickers. They always play the right percentage. I watched them and learned from mistakes and repetition. Over time, playing the same shots over and over, I got a feel for it. With repetition, kicking will become muscle memory. Systems are okay, but you will be much more effective playing by feel once you�ve logged enough hours practicing and in competition. Here is a practice drill that I like to do. It�s pretty simple, but great practice. I break the balls like normal, because I prefer that to simply throwing the balls on the table. After the break, you can kick at any ball. The object is to complete as many successful kicks in a row as you can. The only caveat is that the kick must be a minimum of two rails. Most of the pros prefer two-rail kicks because the object ball is �bigger.� You have to be more precise with a one-rail kick, which makes them harder. 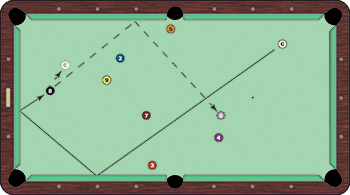 The only time pros will opt for the one-rail kick is when the object ball is right in front of a pocket or in the middle of the table, where you can kick it in a side pocket. When you first start playing, you will simply try to make contact. But you should soon start to play the shot with purpose. When doing this drill, regardless of the ball I select to kick, I play it like it is the lowest numbered ball on the table. The key is to try to create space between the cue ball and the object ball. Also, normal rules apply, meaning the cue ball or object ball must touch a rail after contact. You have to understand what gives you the best chance of leaving your opponent a difficult shot. Over time you�ll come to realize you may be hitting the balls at the wrong speed. When the object ball is near the rail, the key is to move the object ball to the opposite end of the table. Again, create distance. I would say that on 70 percent of the kicks, we�re looking for the speed that will get the object ball the full length of the table away. Speed control is massive. Another thing: Look over the whole table. Know where the other balls are. When I�m kicking the 2 ball, the first thing I look at is where the 3 ball is. I don�t want the 2 going near the 3. Play percentages. Work out where the other balls are on the table so you know where best to send the object ball. This is a great drill for getting a feel for the table, and it offers a nice variation of shots. You will need to spin more on some shots, and on shots where there are only two or three balls left on the table and no place to hide, you�ll have to learn to use more speed and hope to get lucky. Keep kicking at balls until there are no balls left on the table or until you miss. You can even play a race to 30 points with a friend.